Kepler 4 is a combined program for the calibration and conformity of torque wrenches to BS EN ISO 6789:2017, BS EN ISO 6789:2003 or your own in house standards. It uses a system of databases to keep track of each individual torque wrench and all associated information. 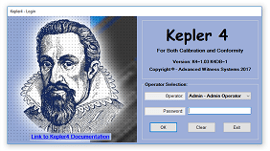 To Download a trial version of Kepler 4, visit the Software Downloads page by clicking below.